I've got to throw out an opinion on this episode, as it was the first of a type of show that screenwriter Ronald D. Moore seemed to want to champion. The idea was to slow down the pace, and do longer, slower, deeper scenes with the main characters. No doubt the budget-saving aspects of this would have appealed to the producers. I wasn't too keen on it at the time when they made these shows, since the pace of their faster action-based episodes felt about right, but in light of today's frenetic TV, the deeper pace and character scenes seem to be something that TV should aim for more often now. The bigger problem with episodes like this is that there really isn't enough meat to make the scenes as deep as the writer intended. It's a little too obvious to the audience early on in this one, for example, that there is an ideal match between the guest star's risky surgical technique and Worf's glory-or-die cultural philosophy. The story really isn't going anywhere during the lengthy scenes that serve to delay their mutual involvement in the surgery. Some of it is necessary set-up, of course. I just don't see the value of all those arguments in favour of less-than-ideal solutions, whether it is Picard saying that Worf can't make the journey to learn to live as a paraplegic, or Worf arguing for suicide, or Crusher arguing that a glorious solution is too risky a road (she should let Worf make that decision for himself, and simply decide for herself whether or not she is going to participate in it as a surgeon). There's also a problem of generalizing, most notably that because Crusher witnesses Dr. Russell making a poor choice to side with risk in an early case, she decides that all of Russell's choices to side with risk must be equally wrong - and pretends that Russell isn't smart enough or human enough to learn from her own error. Though I'm squeamish enough about operations that I wouldn't recommend as much graphic footage of the actual operation in the finished program, the conclusion of this episode must get a few points for making me believe, on first viewing, that Worf had been killed off on the show. 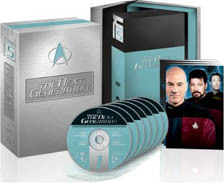 Some of the credit there must go to the fact that this cast did shake itself up every year-and-a-half or so, beginning with its loss of Tasha Yar (which some of this episode echoes), and continuing with the loss of Wesley Crusher, and the temporary replacement of Beverly Crusher. The show seemed to be right on schedule for another main cast shake-up at this point in season five. Also, the director and the principle actors pulled off an incredible job here. But in hindsight, it's a bit of a wasted effort. As we otherwise suspected from the beginning, the characters all return to their starting positions again, and if you missed this episode in the season five run, you'd never have known it. If there's any long term growth here, it simply seems to be that Brian Bonsall makes his first return to the show to play Alexander, proving that he's now a recurring presence that can mix it up with the other regulars and deliver on their level. Good stuff. As an episode, this one seemed to take an unnecessarily slow, overly emotional, and overly complicated route to get to the obvious, and is not one of Star Trek's greatest. What really convinced me that this was not the way to do Star Trek was the next episode attempted in this mold: "The First Duty", where the Moore pattern of wallowing in the emotional crap of "loss" became too pronounced to be of good taste, having too few elements of other flavours to balance the story. Better character-based long-scene-filled episodes of sci-fi TV have been done before and since.